Welcome to Paddy's. The building was originally called the Power Building when first constructed. Later in 1888 the 3rd and 4th floors were added as a hardware store. In 1940 the bar became known as the Harbor Bar, and was primarily a gay brothel for many years. The Harbor bar came with a mezzanine, but in 1979, Richard Stuman, the owner, got rid of the mezzanine. The booths around the windows are actual church pews, but from which church is not known. The bar inside has two fiberglass pillars that are replicas of the pillars outside of the bar. 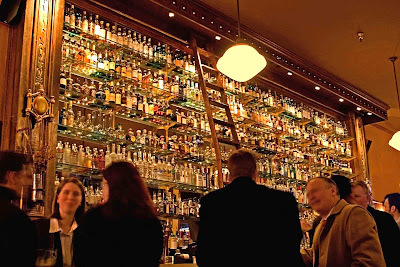 The bar wall hosts 400 types of liquors. Drinks and food here are guaranteed fresh – due to the fact that this old bar cannot contain a refrigerator large enough - all the better for the customer.